Veteran consumers, first-timers, twenty-somethings and retirees were among those who defied triple-digit temperatures before they made it into stores across the Las Vegas area, some of which opened shortly after midnight and later provided free water, live music, valet parking and coveted promotions on their valuable product. Eager employees guided customers and answered questions from product potency to Nevada's consumption regulations. Minnesota resident Edgar Rosas Lorenzo on Saturday flew with his family to Sin City for his sister's wedding. But even before he checked in to his hotel, he stopped at a dispensary on the Las Vegas Strip. "It was worth the wait. I'm going to come get some more tomorrow," Lorenzo said after paying about $60 in cash at Essence dispensary. "It helps me sleep. I get back pain. I have a slipped disk." Some dispensaries took to social media to spread the word or tried to draw in buyers with special events. 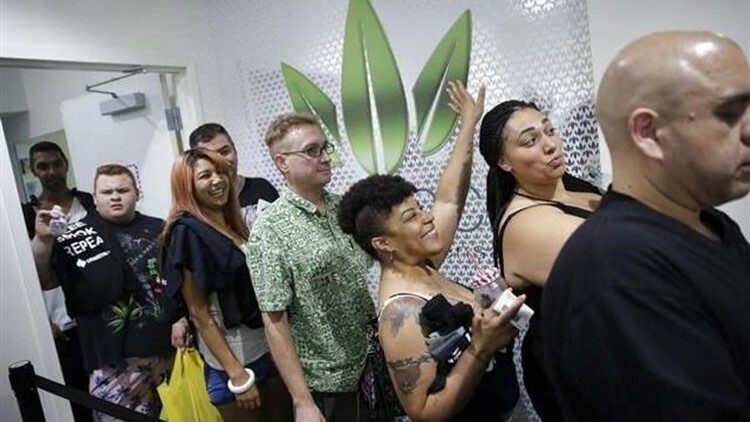 Some gave away free marijuana to their first 100 customers, and at least one entered buyers into a raffle for free pot for a year. Those 21 and older with a valid ID can buy up to an ounce of pot. Tourists are expected to make nearly two of every three recreational pot purchases in Nevada. But people can only use the drug in a private home as it remains illegal to consume it in public, including the Las Vegas Strip, hotels and casino floors. Violators face a $600 fine. "I have yet to figure that out," Lorenzo said of where he will smoke the weed he got at the Essence dispensary, which along with others had stacks of pamphlets stating the regulations in every checkout station. Deneal, a Las Vegas resident, said she is elated at being able to legally buy the drug that for decades she has had to buy through acquaintances. Smoking marijuana helps her cope with health conditions while also working a stressful job at a bank, she said. "It looks like they have enough stuff for everyone, it's just a question of getting through the door," Deneal, 57, said. Lorenzo immediately posted photos of his stash on Snapchat. His friends have said they're jealous and asked where he bought the products, he said. Lorenzo said he will plan another trip to Vegas specifically to be able to legally purchase marijuana, not to visit the city's world famous casinos. "We just got here ... Instead of looking around in Vegas, I'm in a dispensary," he said. Hundreds of people lined up outside dispensaries that opened from 12 a.m. to 3 a.m. and had to turn away customers like Deneal. At Essence on the Strip, people were excited and well-behaved as a lone security guard looked on. A cheer erupted when the doors opened. Despite the limits on where people can get high and restrictions on where the industry can advertise, dispensaries worked furiously to prepare for the launch. They stamped labels on pot products, stocked up their shelves, added security and installed extra checkout stations. "I've been living in Vegas for 15 years, and I keep missing the cities that legalize marijuana and edibles. So I'm happy that it's here now," said Babs Daitch, who was waiting in line.